Do you ever find yourself searching for an appropriate prayer or devotion to open a staff meeting with? If so, Staff Talk is a comprehensive resource you'll return to again and again. A year's worth of brief meditations, all uniquely suited for building a sense of community and trust among your personnel, are in this extraordinary volume. Wil Jackson draws on his extensive personal experience to share practical, effective insights in imaginative and engaging language. 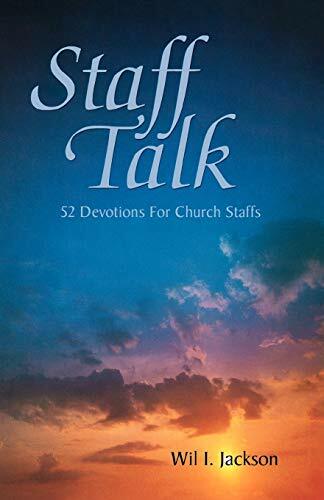 A wide variety of themes and topics are covered, including sections on building a covenant relationship, employing good management principles, and equipping laity for ministry within the body of believers. There's even material especially appropriate for retreat settings. Developing a cohesive and mutually supportive professional and volunteer staff is a great challenge. Jackson's book offers hope and direction for those who lead. Wil Jackson knows the value of team building. In Staff Talk he shares nuggets of wisdom that are keys to developing a church staff into an effective and powerful team. A splendid tool to help a church staff deepen its relationships and common goals. Wil Jackson served many congregations during 40 years as a United Methodist pastor in the North Carolina Conference. A graduate of High Point University and Duke Divinity School, Jackson has contributed to The Upper Room and is the author of The Pew Talks Back.